Hi Guys, at present time each and everyone like to use Android phone in his daily routing life. Lot of time you have to open different applications on your Android phone. You have to close all running apps one by one, which consume some time. 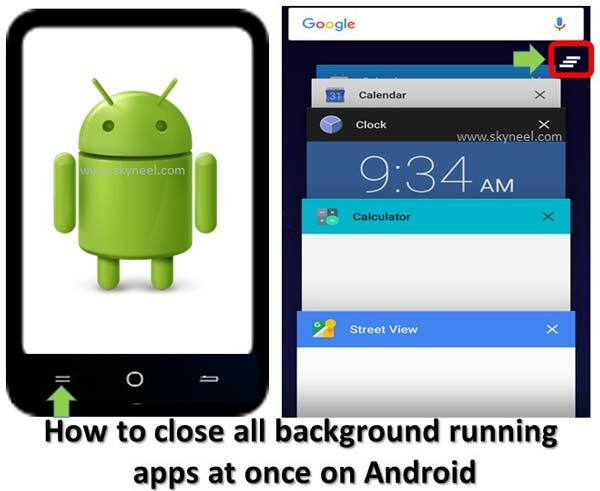 This article helps you to close all background running apps at once on Android. There are different operating system used in Android phone. If you want to close all background running apps at once on Android Lollipop then you have to take few simple steps on your phone. There are different great and interesting features on your Android Lollipop. There are lot of tips and tricks available for Android Lollipop but most the person don’t try these tricks. Today we have to discuss an important trick to close all background running apps at once on Android. Lot of time we have to open different application on our Android phone. We have to forgot unused all running apps from our Android phone due to which phone battery reduced. All these running background apps consume system resources due to which phone speed is also slow down. If you have lot of background running apps on your Android Lollipop and you have to take some time to close them one by one. But after reading this article you will be able to easily close all background running apps at once on Android. Step 1: First you have to unlock your Android Lollipop. Step 2: Tap and hold-on overview button on your Android Lollipop. The overview button is placed either left or right side of your Home button , which is depend on the model number of your phone. Step 3: Tap and hold-on the overview button, now you will get all running background apps screen on your Android Lollipop. Step 4: Tap and hold-on three horizontal lines which is located on the top left side of all background running apps on your Android Lollipop. Now release your finger from horizontal lines, it will close all background running apps at once on Android recent screen on Android Lollipop. Lot of novice users face this kind of situation now this article helps you to close all background running apps at once on Android Lollipop. Share you knowledge with other, because we believe knowledge in always help us. If you have any suggestions regarding this article then write us in the comment box. Thanks to all.